Robotic systems are moving closer toward being able to “live” in subsea docking stations, as permanently installed subsea resident vehicles. For the 40 years that the oil and gas industry has been working subsea, there’s been a gradual evolution in the technology it uses. Remotely operated vehicles (ROVs), built to perform underwater tasks in place of divers, have evolved from fairly crude machines to today’s highly capable and complex vehicles, with many now electrically powered. Autonomous underwater vehicles (AUVs), which operate without a tether (umbilical) are now supplementing ROV operations, by providing an alternative for survey operations including pipeline. But there’s now also another new entrant to the subsea underwater market: resident vehicles, from resident ROVs to hybrid vehicles. One of the main drivers is cost reduction. ROV support vessels cost a lot. Remove the need for the vessel and a significant percentage of the cost of the operations is removed, Statoil’s Tom Glancy, Advisor Pipeline Mapping & Geographical Information, told an International Association of Oil and Gas Producers event in Stavanger last year. Having a vehicle living subsea, in “garages” or docking stations, could also reduce wait-on-weather time, operations costs in harsh conditions, and health, safety and environmental issues. It could also mean the ability to collect more data and mean faster response time. Another driver is the move by oil firms into ever deeper waters. It’s not a new concept. French subsea robotics firm Cybernetix, now part of TechnipFMC, developed the Swimmer concept – a shuttle to deliver a work class ROV to a docking station subsea – and then the ALIVE (autonomous light intervention vehicle) concept (an intervention-AUV, or I-AUV) in the late 1990s early 2000s. Subsea 7 has long been developing its autonomous inspection vehicle (AIV) resident concept and in recent years has been testing the vehicle offshore, including docking ability. BG Group, now part of Shell, developed the FlatFish AUV, with the help of German research institute DFKI and Brazilian research organisations. It is an inspection and survey vehicle which was aimed at being able to be launched from a floating production platform or docked subsea. (read more in November/December 2016 MTR). In March, Saipem and Shell agreed to work together to commercialise the FlatFish. There is now increasing interest from other operatots. Since 2016, Norwegian oil and gas operator Statoil has been investing in programs to trial subsea resident vehicles, initially using existing electric ROVs. The operator is taking the idea so seriously that it’s coined (and trademarked) a new phrase, the underwater intervention drone (UID). A vehicle already operating in the market is Saab Seaeye’s Sabertooth. 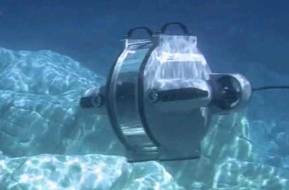 The Sabertooth, which demonstrated docking capability in 2013, is a hybrid hovering ROV/AUV. The Sabertooth can work as an AUV, ROV and hybrid, has payload adaptability – which could soon also include a work class electric manipulator - and can work in 3000m water depth (with a target for 4500m). It can be operated via a thin fiber optic tether real-time communication/control at excursion ranges of up to 12km and can operate much further in AUV mode, without the fiber cable. For autonomous operations, Sabertooth is fitted with sensor reactive control and enhanced navigation capabilities, says Peter Erkers, sales director, underwater systems, during the Subsea Valley conference in Oslo in March. These capabilities, including autonomous docking, got Sabertooth on Italian oil firm Eni’s Clean Sea project, a subsea monitoring system covering oil spill detection, pre-planned surveys along flowlines and pipelines, and inspection of subsea production systems (SPS). A Sabertooth is also being used in resident system project for offshore wind farms, being developed by U.K.-based Modus Seabed Intervention, with engineering firm Osbit and the Offshore Renewable Energy Catapult. This year, Modus will be trialing an AUV docking station with a Sabertooth, for recharging and communications, in an indoor tank before going offshore to an Innogy-owned wind farm, Gwynt y Mor. In AUV mode, the Sabertooth has already done multibeam echosound pipeline tracking, magnetometer/gradiometer pipeline tracking and bottom sediment sampling. An electrical torque tool and an Orion a sensor for detecting buried pipeline or cable tracking have also been developed. Saab Seaeye also has plans for autonomous contactless cathodic protection measurements, using field gradient sensor technology. It’s also working on autonomous structure inspection and riser/umbilical/mooring chain inspection operations, with trials in all these areas planned for this year. In addition, Saab Seaeye is working on feature-based identification for navigation, enhanced station keeping, remote control from an unmanned surface vessel (ASV) and also to demonstrate and commercialize 3D terrain navigation and 3D object recognition. To this will be added 3D mapping and 3D vision capability, to enhance tracking/navigation capability, position estimation, stereo vision and the ability to compute distances to objects, says Erkers. For long-term resident capability, Saab Seaeye is planning to add recharging and data upload/download capabilities and then carry out long-term testing and a reliability enhancement program. Saab Seaeye is also developing its own electrical manipulator, equivalent in size and power to an industry standard work class ROV manipulator, such as the Schilling T4. Prototype joint testing was carried out late last year and it is due to be launched to the market in Q4 2018. Saab is also looking at other electric tooling. One of the latest concepts to emerge on the market is Oceaneering’s Freedom. Oceaneering says that the 3.3m-long vehicle will be able to perform inspection, advanced survey, and light intervention work, under a modular design. This will mean it can be configured for the mission it’s required for. Freedom will have a common center section, housing system components that will support four different vehicle configurations: inspection and light intervention; towed, long range survey and long-range inspection. The different configurations are created by switching out the vehicles nose and aft sections. The vehicle will also have access to a suite of intervention tooling, stored subsea. As a resident vehicle, Freedom will operate out of one or more docking stations, which provide power for recharging, tooling, and data upload and download. This will be in a frame, sitting on a subsea base (suction anchor), which contains a launch and recovery and docking basket. The basket would be used to recover the vehicle for any maintenance, etc. The docking station will also house system components like navigation aids, battery packs and control infrastructure, and a homing beacon for the vehicle to home in on, says Iversen. Iversen says the vehicle would be able to go on 50km excursion, untethered. Oceaneering is aiming for offshore prototype trials Q2 next year. Saipem also has a resident vehicle concept, which is part of a fleet of vehicles, labelled the Hydrone platform. The SonSub Hydrone platform was designed to perform life of field subsea services and includes the Hydrone R, a resident vehicle, Hydrone W (a work class semi-resident ROV) and Hydrone S (an advanced survey and inspection unit). They would use a subsea docking stations, called ByBase (for permanent deployment) and HyBuoy (a power and communication buoy for temporary/permanent deployment), as well as from a vessel when required. The Hydrone R is described as being able to work as an ROV, tetherless ROV and AUV and able to work down to 3,000m water depth, according to a presentation by Stefano Meggio at MCE Deepwater Development in Milan. It would be able to move between different subsea garages, which would also house various tooling skids, as well as recharging facilities, and would be open to third party component integration, Giovanni Massari, a Saipem project manager, told last year’s Underwater Technology Conference in Bergen. The Hydrone R unit would be controlled from a floating production vessel or from shore. It would also have a “menu” of automated missions, which could be selected remotely by operators onshore and implemented autonomously by the Hydrone-R. The Hydrone-S is an “advanced resident AUV,” says Meggio, with an interchangeable tooling skid, operable down to 3,000m water depth, with 8-12 hour endurance, and 50km excursion ability. Saipem has already been testing remote operations ability with its Innovator ROV, deployed off the Castorone pipelay vessel with control from onshore in Aberdeen via satellite. Meggio says the FlatFIsh concept will share the technologies developed by Saipem for the Hydrone platform. Statoil’s hope is that while there may be different vehicle solutions, that they will “plug” in to the same socket, much like we plug different devices in to the same sockets in our homes. To this end, Statoil has a roadmap to see a field-proven vehicle agnostic docking station on a subsea production system in 2020-23, ready to pilot a UID that can swim autonomously between stations and perform survey and IMR tasks. In fact, Norwegian company Stinger is developing a UID docking station able to support any resident vehicle. Bjarte Langeland, CEO at Singer, says the company is designing two systems: a UID docking station and its “little sister,” a plug socket, which can support multiple power and communications needs but with a smaller footprint. The 9m-long UID docking station would be modular and could be a standalone station or retrofit inside a production template, says Langeland. It would include a vehicle “landing plate” and a tool induction plate, for various interchangeable tools and sensors for resident vehicles to use. Statoil is planning a number of test installations with this system offshore at the Åsgard field and at inshore locations, as part of qualification work. These would have “Lego-like” inductive power supply and wireless communication connection points for vehicles to plug into, which will also mean operations rooms onshore will see live what tools are in place and how well charged they are, etc. The docking station would also have batteries, a bidirectional smart charger. Glancy says the UID concept could be more attractive if it could be a shared service, for example, operated on a joint venture or leased to other operators, as well as for civilian, surveillance, security or other mapping applications. Further into the future, unmanned surface vessels could assist unmanned subsea operations. Glancy says there are still various challenges, however, including the readiness of subsea infrastructure for resident vehicles, regulation relating to unmanned vehicles, and skepticism and resistance to change. But, with a string of roadmaps in place, from vendors to operators and service providers, resident subsea vehicles are just a matter of time.